Casa Milà is the last building of the ingenious architect Antoni Gaudí, before he devoted himself completely to the construction of the Sagrada Familia. The residential building is located in the district Eixample and is one of the most famous and impressive buildings of the Modernisme. Book the admission without having to stand in line in front of the box office. You remain flexible because our vouchers are valid for a single entry throughout the entire calendar year, so you do not have to set your time in advance. Small groups: Modernisme Guided Tour up to 12 people. Coffee or another drink in the "La Pedrera Cafe"
Thursdays and Fridays at 8:00 a.m.
Booking is really easy: simply select the product above, enter the number of persons you would like to book for and click on "Add to cart"
The voucher for the admission will be sent to you immediately after booking. Then simply print it out and show it before admission. Specify number of desired tickets or number of people and click on "Add to cart"
If you book the package "Casa Milà by day or Casa Milà + Modernisme guide (open)", you must indicate the day on which you want to take the Guided Tour. The booking confirmation will be sent within 24 hours. Cancellation policy for the "Casa Milà (La Pedrera) + Modernisme Tour (open)" package: free cancellation until 2 days before the day of the tour. If canceled later or in case of no-show, no refund will be given. The services included in the package can only be canceled together. "La Pedrera" translates to "the quarry house". Casa Milà got this nickname because of the unusual construction. The large stone slabs of the facade were attached first and then worked on by the stonemasons. And the facade, with its irregular shapes, reminds of a quarry. The front of the house looks like a massive rock, broken only by wavy lines and iron ornaments. The bright stone and the otherwise colorless facade of this building distinguishes it from Gaudí's other works and looks very expressionistic. The house consists of two components, which are connected only by the facade, the ground floor and the roof. Each has its own yard and entrance. The curved facade is a unique example of organic architecture. It stands in contrast to Casa Batllò, with its colorful and playful facade. Gaudí deliberately focused on the design of the building, used very little paint and left the materials natural. The city of Barcelona declared Casa Milà to be an architectural work of art already right after completion. As the first building of the 20th century, Casa Milà was listed as a World Heritage Site by UNESCO in 1984. The construction of the interior was groundbreaking as well. The house has a natural ventilation system, which makes an air conditioner unnecessary. Gaudí's plans also included a lift, but it wasn't built into the house until much later. Colors and natural, round shapes decorate the courtyards. The stairs that lead to the entrances of the apartments wind along the walls. Gaudí designed Casa Milà exclusively with natural shapes, so that there is hardly a right angle to find anywhere. In addition to the courtyards, you can also visit an apartment in modernistic style from the beginning of the 20th century. The Belletage (in English "beautiful floor") was originally reserved for the owners, the tenants and employees lived on the upper floors. Today, the Art Museum of Fundació Catalunya - La Pedrera is located on the Belle Etage. The interior walls of the Casa Milà can be moved with little effort, which was made possible by a concrete-steel construction, which does not require load-bearing walls, similar to what is common in modern office buildings today. Barcelona's most famous modernistic architect, Antoni Gaudí, created Casa Milà. Today it is on the list of the UNESCO World Heritage. The attic of the house is unusually large. In these rooms you can visit an exhibition about Gaudí's life and his buildings. Through subdued music and slideshows immerse yourself in Gaudí's fascinating world and learn a lot about the organic morphology that Gaudí has developed. The highlight of Casa Milà is without a doubt the roof. Not only the outstanding view over the city attracts the attention of the visitors. Rather, the chimneys, ventilation shafts and staircases do it with their imaginative colors and shapes. Some chimneys look like medieval knights guarding the roof. In the attic you can visit Espai Gaudí (the Gaudí Room), a very interesting museum dedicated to Antoní Graudí's architecture and of course Casa Milà itself. The history of this house begins like the history of every residential building. A couple named Milà decides to build a house on their 2,000 square metres large property on the noble Passeig de Gràcia. It was supposed to become a special house, which stands out in the modern Eixample district. To build a special house, you need a special architect. The husband - Pedro Milà - had heard of Gaudí, a very successful and innovative architect. He had just rebuilt the house of a wealthy man, Casa Batlló, which is on the same street. Milà hired Gaudí on the spot and had him design plans for the house. The construction of the house began in 1906 and was completed four years later. With its many groundbreaking details, it is certainly one of the most important modernistic buildings. Surely you will agree that it is one of the most extraordinary buildings in Barcelona. Casa Milà is rightly one of the most visited attractions in Barcelona. Tickets should therefore be booked in advance, as the waiting time at the ticket office is usually very long. The building is a highlight of Antoní Gaudí's works. The roof with its ventilation chambers in the shape of soldiers is impressive. At the museum you will learn a lot about Gaudí's formal language and in the apartment you will get an insight into the everyday life of the bourgeoisie (and its staff) in the time of Modernsime. Here you can book the tickets in advance, you won't need to wait in line at the box office and you will save money. Especially in the early morning hours you can experience the Casa Milà in a quiet atmosphere. You can feel the inspiration and the creative spirit of Gaudí and recognize the connections with nature. 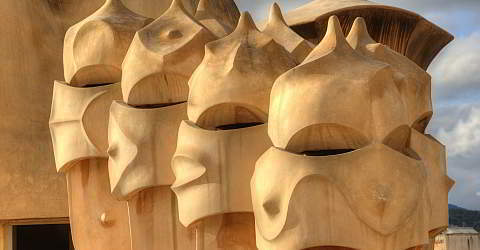 The tour will start at 8:00 o'clock - this is before the regular opening hours of La Pedrera. 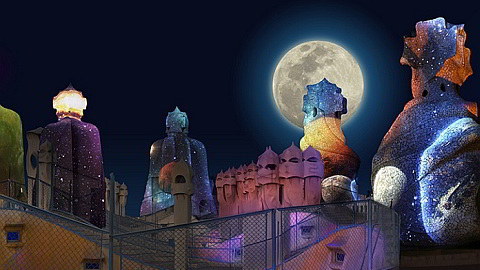 Visit Casa Milà in the dark with this ticket and enjoy a unique atmosphere that would have surprised Gaudí. 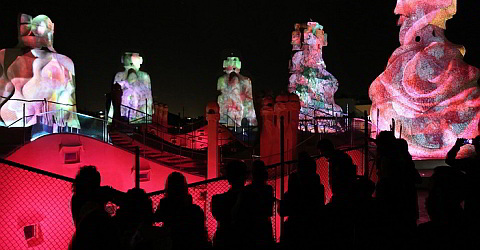 You will experience an audiovisual art installation that casts Casa Milà in a completely new light. Please enter the date and number of Person for whom you want to book the admission. Please enter the desired date and the number of persons you would like to book for. The tour starts on Thursdays or Fridays in English always at 8:00. The admission is included in the price. For a visit, we recommend that you schedule about two hours. La Pedrera is one of the most visited tourist attractions of Barcelona, which sometimes has longer waiting times at the checkout result. With the pre-booked tickets, you can avoid the queues. Visitable are the roof, the museum in memory, which is typical for Burgoise middle of the modernist apartment on the fourth floor and courtyard. On the first floor there are temporary exhibitions, but an extra entry cost.